Hello! I'm excited to take part in this year's IGMC. In 2138, a method of terraforming called repeating has been discovered. Teams are sent to distant planets with technology to clone themselves. When the clone dies, their consciousness is transferred back to their real body, and they can start the process over with a new clone. 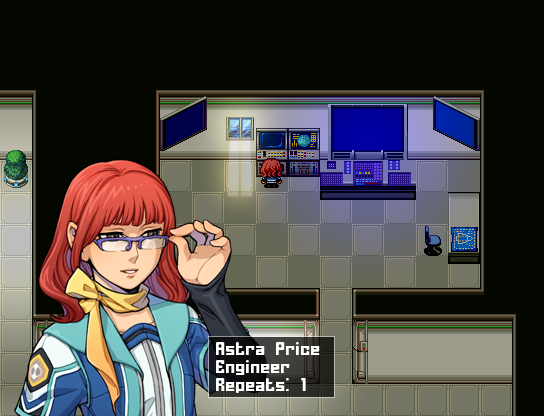 You'll play as Astra, who is the only surviving member of her team after an accident killed her teammates' real bodies. 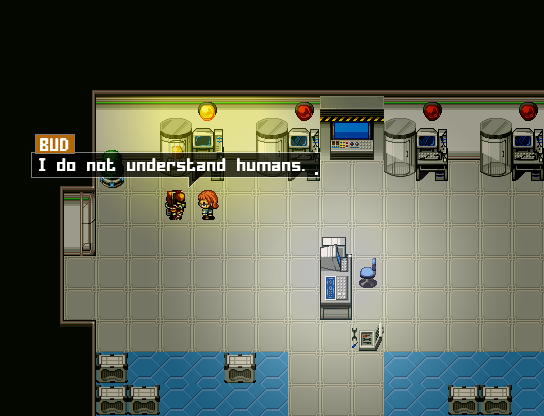 Astra is now stranded on an uninhabited planet with only a sassy robot for company. The main focus will be exploring, with a bit of combat, as you'll have to find materials to fix the base so you can call for help. Dying will not result in a game over, because Astra can repeat. However, with every repeat, she'll lose sanity. If she goes insane, you'll get a bad ending. I also plan to include a survival system, so Astra will have hunger, thirst, and rest that need to be maintained or she'll lose sanity. Here's a glimpse of the graphics. I'm mostly using the DS, DS+, and DS Retro dlc. 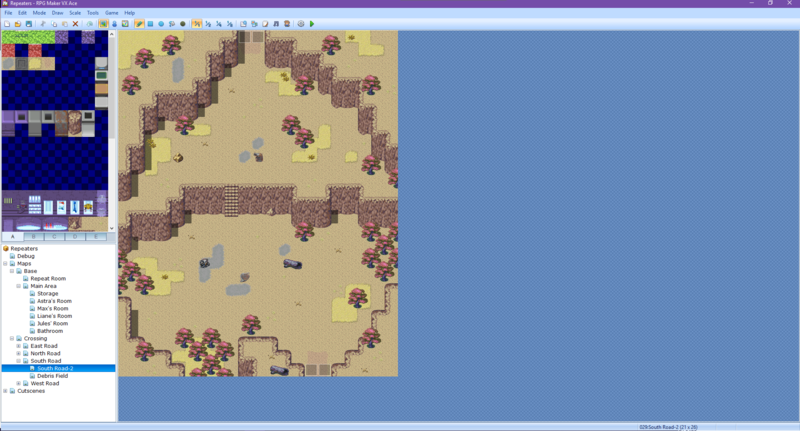 Today I made a lot of headway with mapping. 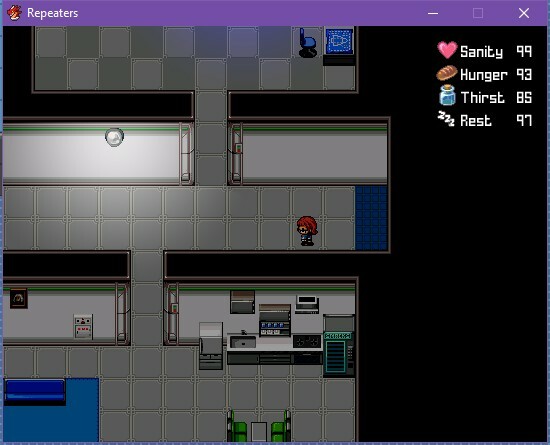 I already had the first few events down, so now that I have the maps mostly out of the way, I can focus on finishing events and uploading a demo! To give the planet a more foreign look, I decided to make the trees a reddish-purple color. Haha I submitted games to the last two IGMCs, and both times I was struggling to finish just hours before the deadline. This time I'm determined to get it ready sooner. This is pretty cool, I can't wait to see how it turns out! Finally started implementing the survival system. I'm using Nicke's Variable HUD script to show it on the map. Still adjusting how quickly these decrease, but they're there! You'll be able to cook food to restore Hunger and Thirst, and Rest can be restored by sleeping. At the moment, Sanity starts to drop when any of the other three are below 30, but this might change as I test it. Life happened and I had a busy weekend, so I did not make much more progress. I've started working on battles but so far the scripts I wanted are not cooperating. It's probably just something small I overlooked. Anyway, that was just a quick update. Now I'm back to work! Repeaters is now up for downloading! Please check it out and let me know what you think! It's still in development, and on the game page I have a list of known issues, but if you find any others, please leave a comment. I uploaded an updated version of the game. I fixed the graphical issue with defeating the final boss, and I finished the computers and Max's logs. The Records Computer now has brief gameplay tutorials. I also added weapons and armors descriptions in the main menu, as I realized I'd forgotten to sooner. Not much time left! The last thing I have to do (unless I find other issues) is adjust the balance in battles. Another updated version has been uploaded. Enemies now drop fewer Credits and more XP. And, after a comment from Xorclev, I also added sound effects for when gathering items. Thanks! Yeah, I'll be playing some too, there'll be more time without working on my own.